Welcome. I'm an epic poet, rhapsode, poet-critic, and the author or editor of ten books. Thank you for visiting. We human beings on this planet need a new vision and understanding of life, to help bring us together, to see and feel and understand our common humanity, to step back from the brink of self-destruction. From the Moon, together, we can see it, a new global, universal vision of life. Many millions of people around the world have already evolved toward such a vision. The Parliament of Poets is set partly on the moon and evokes the story of humanity from Blombos Cave to the dark side of the moon. I hope in time word will spread. Even a brief review of a sentence or two, a paragraph, on Amazon, or wherever, would be greatly appreciated. Please let me and others know what you think. August 10, 2018. Friday. 7:30 to 9:00 pm. Tickets. San Francisco's Shelton Theater, reviving also the art of the rhapsode. I am seeking invitations to read, by arrangement, from my epic poem. Since publication in late 2012, I have given more than twenty epic poetry readings, at the University of Michigan (Rackham Amphitheatre), Wayne State University, Saginaw Valley State University, the Detroit Public Library, Troy Public Library, Hannan Café, Austin International Poetry Festival, Albany Word Fest, Buffalo Small Press Book Fair, Paint Creek Unitarian Universalist, Birmingham Unitarian Church, Troy Interfaith Group, Theosophical Society of Detroit, Barnes & Noble, BookWoman, Crazy Wisdom Bookstore, Espresso Royale, Sweetwaters Coffee & Tea, Himalayan (Berkeley, CA), Tuesdays at North Beach Branch Library (SF), Washington Square Park, Cafe International (SF), Florey's Books (Pacifica, CA), East Side Reading Series, MUSINGS, The Farmhouse, and elsewhere. Search YouTube for "Epic Poetry Readings" and a workshop or Playlist. Epic Poetry Reading at Troy-area Interfaith Group's Authors' Night, Troy, Michigan. 11 minutes. Reading from The Parliament of Poets: An Epic Poem. Best Selections 2015 - 2017. At Hannan Cafe Funded by Poets & Writers, Inc. The story of humanity, from Blombos Cave to the dark side of the moon, drawing from and evoking all of the great spiritual and wisdom traditions and regional civilizations. "Quantum Physics and Poetry – Reflections." Quantum Physics intimates a whole new way of understanding “religion” that can help heal the psychic wounds of modernity. "My Odyssey as an Epic Poet: Interview with Frederick Glaysher," with Arthur McMaster, Contributing Editor, Department of English, Converse College, in Poets' Quarterly (Spring 2015). "And a fine major work it is." The Myth of the Enlightenment: Essays. September, 2014. Hardcover ISBN: 9780982677834. Earthrise Press, 230 pages. Earthrise Press. Printed in the USA, Milton Keynes, UK, and Scoresby, Australia. Online: Amazon, Barnes & Noble, and global affiliates, e.g., Amazon.ca, Amazon.UK, Amazon.in, etc. 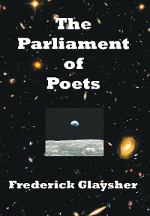 The Parliament of Poets: An Epic Poem. Hardcover ISBN: 9780982677889. eISBN: 9780982677865. Earthrise Press, November, 2012. 294 pages. Earthrise Press. Printed in the USA, Milton Keynes, UK, and Scoresby, Australia. Brick & Mortar Bookstores: Crazy Wisdom Bookstore, Source Booksellers, Book Beat, Mayflower Bookshop, The Wright Museum of African-American History Bookshop. Online: Amazon, Apple iTunes, Barnes & Noble, Kobo, and global affiliates, e.g., Amazon.ca, Amazon.uk, Amazon.in, etc. Thirty years in the making, set partly on the moon, at the Apollo 11 landing site, the Sea of Tranquility. "A great epic poem of startling originality and universal significance... in every way partaking of the nature of world literature." —Hans Ruprecht, CKCU Literary News, Carleton University, Ottawa, Canada, author on Goethe, Borges, etc. "And a fine major work it is." —Arthur McMaster, Department of English, Converse College, in Poets' Quarterly (Spring 2015), "My Odyssey as an Epic Poet: Interview with Frederick Glaysher." One fabulous quality of this poem is its clarity and luminous quality. I love the fact that despite the wide ranging topographical and lexical references this poem is easy to understand and follow: it is a poet writing for people, not one trying to be clever, and not one concealing their lack of poetry in obfuscation." "A great epic poem of startling originality and universal significance, ingeniously enriching the canon of 'literary epics' while in every way partaking of the nature of world literature. Glaysher is in a creative dialog with the greatest epic poets of all time. He is bringing together in beautiful verse form diverse visions of humanity from all over the world, frequently casting them in the form of spatial and cosmic imagery. A pure joy. Contemporary 'world literature' at its best. The cover itself is worth the price of the book." —Hans Ruprecht, CKCU Literary News, Carleton University, Ottawa, Canada, author on Goethe, Borges, etc. Radio Interview > 01/11/2015 Epic poet/visionary Frederick Glaysher﻿... "Frederick Glaysher, he is the epic poet and visionary, and the author of two extraordinary books, The Myth of the Enlightenment and The Parliament of Poets. I recommend both." 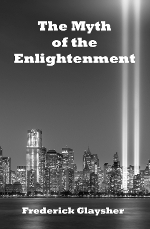 —Mike Schwager, The Enrichment Hour, POETRY, PEACE, ENLIGHTENMENT... Interview WSRadio 23 minutes. "With his new book, THE PARLIAMENT OF POETS, Frederick GLAYSHER is in a creative dialog with the greatest epic poets of all time. He is bringing together in beautiful verse form, tending, as he writes 'to the iambic pentameter, depending on thought and need', diverse visions of humanity from all over the world. Frederick Glaysher's poetic imagination is frequently casting them in the form of spatial and cosmic imagery. That is very exalting to the reader's spirit. What is more, in reading his new book one is not only compassing, beyond the horizon of empirical facts, a borderless world, but one is also beholding the 'oneness' of humankind in a different light. 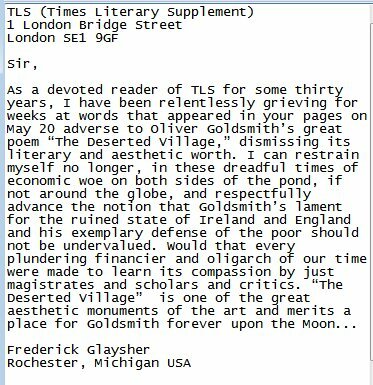 • 'The Parliament of Poets' (Earthrise Press, 2012) by Frederick Glaysher is a pure joy; embodied in a literary work of fine verbal art, it is contemporary 'world literature' at its best. The cover itself is worth the price of the book." —Hans Ruprecht, CKCU Literary News, Carleton University, Ottawa, Canada. August 6, 2013. — a Radio CKCU/Literary News 'encore' 26 minutes (Skip BBC). Other Interviews Here and in The Myth of the Enlightenment: Essays. Epic Poetry Readings and a workshop: YouTube Playlist and this website Here.